The estate planning conversation should include a discussion about organ and tissue donation. Clients may have questions related to organ and tissue donation or may have reached a decision based on misinformation. Attorneys should be prepared to provide information and resources to the client so an informed decision can be made. Three years ago, Billy began to suffer signs of dementia and it became apparent that he needed someone to assist in the management of his affairs. Great-nephew Zeke came to the rescue. Zeke’s spouse, an educated and generally sharp individual, drafted a power of attorney for Billy to sign granting Zeke a general durable power of attorney that included gifting powers. Zeke, using that power of attorney, executed beneficiary designation forms, joint tenancy deeds, and other such documents to assure that he received Billy’s worldly goods. Eventually, Billy succumbed to dementia. The heirs at law, which did not include Zeke, were furious. Litigation commenced and insults were exchanged. 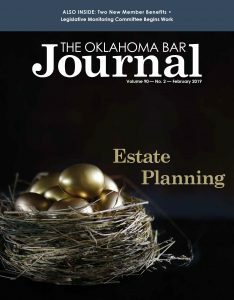 Revocable inter vivos trusts have become a common estate planning tool in Oklahoma and elsewhere, often functioning as a “will substitute” for those who wish to avoid probate and maintain some control over assets after their death. Although estate planning attorneys may presume that similar legal analyses will apply to wills and these estate planning “substitutes,” that is not always the case, even in circumstances this may seem to be warranted as a matter of public policy.1 One of these circumstances, for example, involves the ability of a settlor’s creditors to reach assets in a revocable inter vivos trust upon the death of the settlor. Deferred Sales Trust - What's All the Hype? An emerging alternative to the §1031 exchange,1 wherein the taxpayer has the opportunity to defer the gain on a sale, is a deferred sales trust (DST). Unlike a §1031 exchange, a DST does not require the taxpayer to reinvest in like-kind replacement property and is not subject to the timeline restrictions of a §1031 exchange.2 In short, a DST is an irrevocable trust that utilizes the installment sale treatment under the Internal Revenue Code (IRC) §453 in order to defer the taxes due on the sale of a business, real estate or other taxable assets. The grantor sells the asset to the DST in exchange for a promissory note or deferred installment contract. The DST then owns and controls the asset until it is sold to another third-party for the full sales price. Then, the proceeds of the sale are used to pay the grantor under the promissory note or deferred installment contract. As lawyers look for more efficient ways to serve their clients, companies are developing new and innovative ways to meet this demand. OBA members can now take advantage of discounts on two additional services.